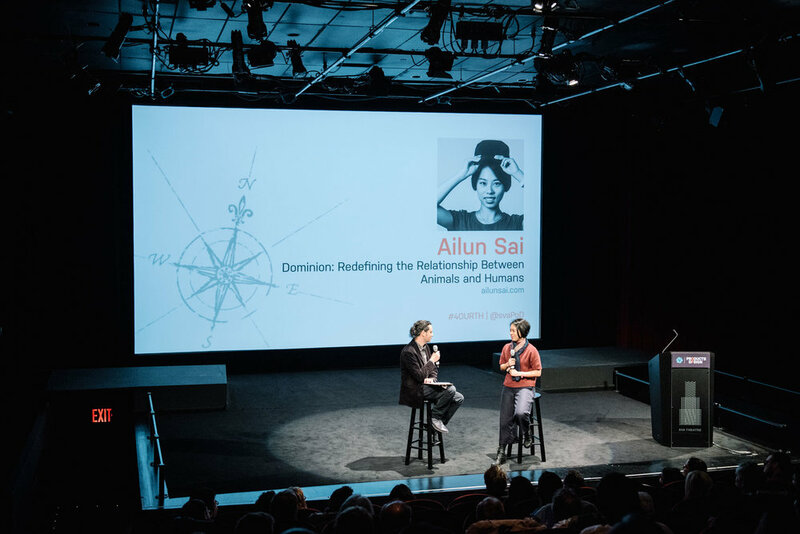 In her MFA thesis, Dominion, Ailun Sai discusses the relationship between animals and humans. Through a series of design projects—including product design, experience design, and interaction design—Ailun encourages people to reflect on their role in the natural world, and to question their perceived sense of superiority over animals. After talking to a variety of experts that included zoologists, veterinarians and pet owners, Ailun realized that many of the assumptions that humans make about animals are inaccurate. Several of her interviewees talked about how humans are not really a "higher species" relative to animals; humans are just different. One of her interviewees, Maya Friedberg, a positive method dog trainer, argued, “Do not compare human intelligence to another animal’s intelligence, because it is just a different type of intelligence.” Her advice motivated Ailun to explore the power dynamic between humans and animals. Most humans think that they are the most advanced species in the world and, consequently, assume that they therefore have power over animals. They believe that they are the only species that has the cognitive capacity to make tools, use verbal language, or develop technology. But animals have this cognitive capacity as well, submits Ailun. "For example, parrots can make their own tools in order to search for food; gibbons communicate using more than 450 different sounds that have clear meanings; squirrels pretend to hide seeds when they know others are watching; and, bumblebees can solve complex problems even faster than computers." In his book Are We Smart Enough to Know How Smart Animals Are, writer Frans de Waal discusses the egotistic blindness of humans to the truth about other species and their value. He argues that the reason that people think they have dominion over animals is only because they understand animals only from their own, human point of reference. “We should attempt to understand a species’ intelligence only within its own context,” states de Waal. Ailun investigated the question of dominion through three lenses: Animals as food, animal as intruders, and animals as companions. Her thesis specifically explores urban environments, where human and animal interactions happen rather frequently. She investigated the above question through three lenses: Animals as food, animal as intruders, and animals as companions. Humans influence the lives of animals. Animals, through their meat, influence humans. For example, in order to make one pound of beef, humans have to use 2,500 gallons of water, 55 square feet of rainforest, 16 pounds of grain, and 80 kilograms of CO2. Eating meat can cause many health problems for humans. Scientists have long connected processed red meat with a wide spectrum of chronic diseases, such as cancer, diabetes, and heart disease. Researchers at Harvard Medical School have found that people who ate three ounces of red meat every day were about 13 percent more likely to die before the study ended, than those who did not consume red meat. (The observed causes of death were heart disease or cancer.) The study also stated that daily servings of processed meat, such as bacon, raised the risk of an early death by 20 percent. In the era of industrialized livestock agriculture, countless animals are violently killed for human consumption; we humans accept this as "just the way of the world." Most humans do not feel badly when they are eating meat, because they have no direct involvement in the killing or the mistreatment of the animals that they eat. Ailun states, “I think people have a right to choose what they eat. What I find problematic, however, is that through their language and mentality surrounding eating meat, humans separate the product and flavor from its sentient animal source.” This disconnection between humans and the consumed animals inspired Ailun to explore thoughtful and meaningful ways in which people could feel a connection—while still maintaining their omnivore diets. Tempera is a speculative product line of spices, herbs, and flavorings in the form of “edible makeup” for humans who eat meat. "Meat on a plate was once a living, beautiful being," says Ailun. "It had an identity before it was sacrificed for consumption. The humans who eat the meat are, however, unaware of the meat’s prior identity." "Out of respect and love, humans put clothes and makeup on their deceased to make them look alive before cremation or burial." Ailun posited, "What if we applied the same ritual to our food?" "Before we humans eat a piece of meat, we must apply 'edible makeup' to it," Ailun submits. "Traditional sauces and spices are packaged in cosmetic bottles, and cosmetic tools should be used to apply them onto the meat. This application mimics the behavior that we use on our deceased. By doing so, we will get the desired taste of the meat, and show proper respect to the animal we are about to consume." "As we reflect on this flavoring process and relate it to our own lives, we will have the opportunity to re-evaluate our meat consumption, and begin to respect meat even more. Eventually, we might reduce that consumption to healthy and moderately-sized portions." "In urban areas, humans feel that animals intrude on their space. However, the fact is that animals lived in urban spaces first," Ailun argues. "To them, humans are probably the real 'intruders.'" "Animals have moved into cities because their natural habitat has been destroyed, or taken over by human beings. However, humans living in cities hate the interference caused by these so-called foreign visitors. We take extraordinary measures to keep animals away: For example, homeowners oftentimes install spikes on ledges to keep pigeons away. But no matter how hard people work to keep them away, animals rarely follow along the intended plan. They somehow adapt their ways so that they can inhabit urban centers. Since coexisting with urban wildlife is inevitable," Ailun says, "humans need to learn how to do so, and also develop empathy for these beings." To explore this idea, Ailun held a workshop where she had people act as animals so that they could experience how the animals interact with the world. To help the participants build empathy for the animals, each participant was asked to act as an animal during the first half of the workshop. During the second half, Ailun asked her participants to design something for humans from the perspective of the animal they had pretended to be earlier in the workshop. People came up with lots of unique ideas. For example, one of the participants who behaved as a cat designed an eyesight catcher to help cat-human communication. Wildeye leverages new technology to redefine humans’ relationship with urban wildlife. Humans make space for the animals in return for a new perspective of the city. Wildeye is an immersive VR experience that provides people the chance to explore the city from an animal’s perspective. The app would be developed in collaboration with local urban wildlife foundations and serve to help fund their work. Here, animal care experts place micro-cameras and navigation trackers on rescued animals. This allows users to see what an animal’s life is like, and understand the challenges they experience while living in urban areas. Users have the option of selecting from eight species, after which they put on their VR devices and enjoy a live-stream of the animal’s view. After each experience, users can support the urban wildlife foundations by donating to their cause. While Wildeye leverages new technology to redefine humans’ relationship with urban wildlife, humans make space for the animals in return for a new perspective on the city. Many pet owners provide their pets with the best conditions and supplies—but do those things actually meet the pets’ needs? There are 46.3 million US households that have at least one dog. Mintel’s Pet Food and Supplies reports that 66% of pet owners “treat their pets with as much care as they would a child.” Many provide their pets with the best conditions and supplies—but do those things actually meet the pets’ needs? Many dog owners believe that they know their dogs very well, but do they understand their dogs? To explore these questions, Ailun created an experience that helps people increase their knowledge and awareness. Unlike traditional pet-friendly spots, this eatery not only allows pets to eat with their owners; it requires owners to consume food like their furry friends! Nibble & Sniff is a pop-up restaurant where pets and owners can hang out together. Unlike traditional pet-friendly spots, this eatery not only allows pets to eat with their owners; it requires owners to consume food like their furry friends! The goal of this installation was to encourage people to experience how their dogs eat, and thus build a deeper understanding of and connection with their pets. Instead of using paper menus to order food, customers at Nibble & Sniff relied on their sense of smell to choose what they wanted to eat. Customers sniffed a sample tray with the menu items, and told the waitress which one they wanted to order. Then, they were given a pair of “paws” to wear—limiting the use of their hands. The napkin was fixed on a customized holder. Food and drinks were served in dog bowls. Diners had to use the same gesture as dogs to enjoy their meal. Ailun designed Releash—a set of leashes that allows a dog owner to explore the different experiences their dog has on its daily walk. For example, Sniffing Leash enables the owner to take in the same smells that a dog typically encounters. The Marionette Leash flips the privilege and puts the dog in control of its daily walk—the dog leads the way, and the dog walker follows without any resistance. Each leash represents a potential, "reimagined" dynamic between pets and owners—encouraging people to put themselves into new relationships with their pets. Ailun hopes her thesis will inspire people to fundamentally re-evaluate their relationships with animals. She encourages others to reflect on their role in the natural world, and to question their perceived superiority. Ailun sums up, "Animals and humans are both living on the same planet. We need animals, and we need to respect them in order to support our lives—along with theirs." Learn more about Ailun Sai's work at ailunsai.com, and contact her at ailunsai[at]hotmail[dot]com.